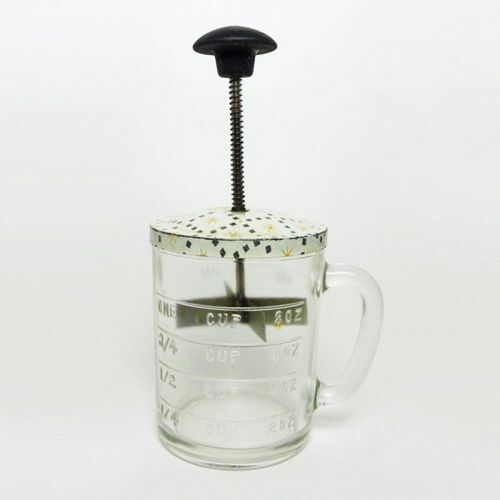 Add your food to the glass measuring mug with convenient handle and place the pressed tin litho lid apparatus on top. Pushing down on the wood knob of the spring action plunger allows the four metal blades to chop or grind the your nuts, cheese, spices, herbs and more. Other side: One Cup 8 oz. 3/4 cup 6 oz. 1/2 cup 4 oz. 1/4 cup 2 oz. There are no chips or cracks in the glass jar and no dents or cuts in the pressed tin lid. Normal to below normal wear for age and use adds to the vintage charm of this old food grinder and/or nut chopper. Very clean and ready to use in your retro or display.